During March 1983, Joe and Gaby finally bought somewhere to live. The blue terraced building of 37, Lancaster Road in Notting Hill was situated a matter of yards away from Ladbroke Grove and the Westway, and was exactly the type of house Joe used to squat in his 101'ers days. On the corner stands Basing Street Studios....where "Do they know it's Christmas" was recorded. 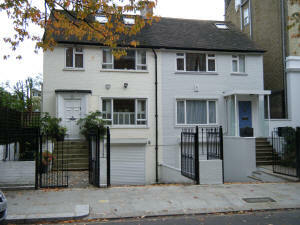 Around the same time, Paul Simonon became the first property-owning member of the Clash when he secured a mortgage on a tiny two-bedroom basement flat at nearby 42B, Oxford Gardens The original layout included a lounge and a compact bedroom either side of an internal bedroom, with a kitchenette at the back looking out onto a small yard. 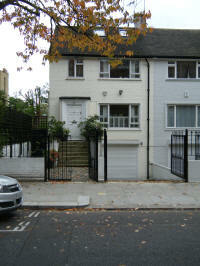 Paul lived here from 1979-1982. 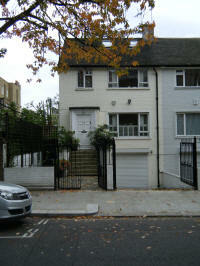 He then moved over the road to a small modern house 53 Oxford Gardens which is where the back cover of 'Cut the Crap' was taken. 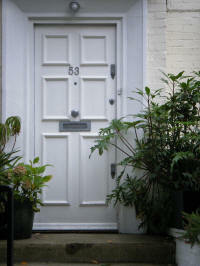 Paul still lives in Notting Hill with his wife & their two boys. "....although they would keep 37 Lancaster Road, they would move out of Notting Hill and set up home close to Andover in Hampshire, in Bransbury Cottage owned by John and Amanda Govett." (p.498-Redemption Song). Take junction 9 off the M3 and head to the A303 and turn off to BARTON STACEY. Gaby's close friend invited both of them to join her in Newton Stacey to a farmhouse, where the peaceful ambiance was the perfect setting for Joe to set up a home studio at the farm. He spent the next year teaching himself how to use the equipment while simultaneously working on songs for the soundtrack to another movie, When Pigs Fly. LOCATION: Is this Abbots Mitre Pub? Joe and Lucinda Tait (maiden name) were married at the Kensington and Chelsea Register Officer in the King's road on 31st May 1995. 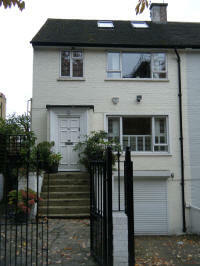 Joe rented Paul Simonon's basement so providing him with a base in London. Whenever Joe was back in London, the two old friends enjoyed spending time together, staying up late to play records, drink and talk. Junction 5 of the M3 leads into HOOK. The (B3349) road takes in the village of HECKFIELD with THE NEW INN pub just yards away from Ivy Cottage. Exiting the pub car park, Ivy Cottage is on the left, just pass the sharp bend. 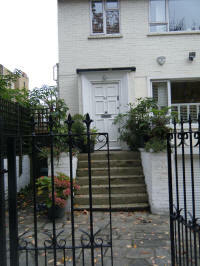 The present owners of Ivy Cottage stated that Joe Strummer actually rented the cottage from the Guinness family, who lived around the corner from Joe. They often spent time with Joe up in the woods, just behind the cottage, strumming and singing songs around a camp fire. "Joe rented a house on the Guinness estate, Ivy Cottage, in Hickfield, near Basingstoke in Hampshire which Hugo Guinness had available." (P.514-Redemption Song). Here Joe set up another studio in the wood shed, which he named 'The Woodshed'.
" One Summer's evening in 1996, Joe Strummer lit a campfire in the garden of his tumbledown country cottage near Hook in Hampshire. Sat around the flames were various friends, family and musical collaborators, including Bez and Kermit from Happy Mondays off-shoot Black Grape, plus their twilight entourage of gangsters, dealers and vibe-merchants. When Bez produced some ayahuasca, the natural hallucinogen derived from Brazilian tree bark, things began to get a little bendy," states Pat Gilbert in the June 2006 Mojo edition.
" I was writing some songs in the Woodshed, Joe's garden studio," smiles percussionist, songwriter and future Mescaleros Pablo Cook. " We were having a great time. At the beginning of the session I'd asked Joe to get me a special microphone. He said, 'Sure,' then joined the party. For the next 48 hours, I watched everyone getting further and further away from reality." Two days later, the campfire still burning, Cook took a break to check on his mates. The scene that met his eyes was like something out of Apocalypse. Now Bez, hallucinating that a plane had crashed into his house, killing his family, had tears streaming down his face. His friends weren't in much better shape. Joe, meanwhile, was nowhere to be seen. Pablo went into the nearby wood and called his name. " I was shouting, Joe! Joe!" Cook explains. "Then this pair of beady eyes came out of the woods. Joe had false teeth and they'd fallen out, so his mouth was all black like he'd been sucking on an exhaust pipe. I said, " What's going on, are you OK ? Did you get the microphone ? " 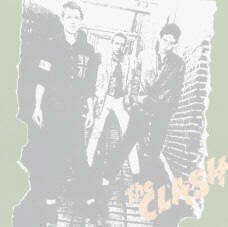 He said, " Oh man, I couldn't find a microphone and I couldn't find any Benson & Hedges either. He'd been in the woods for two days, tripping." The back garden runs alongside the busy road. Joe supported the community by performing in the Memorial Hall helping to raise funds for the local church. The Church was hidden away on the other side of the road to Ivy Cottage. On 17th December 1997, Joe and family moved to 'Yalway', just north of Taunton and to the south of Bridgwater, in an ivy-clad converted farmhouse with a salmon-pink painted door in the vicinity of the quiet village of Broomfield on the Quantock Hills in Somerset to raise his second family, with his wife Lucinda, two daughters and one stepdaughter. Joe settled in well and loved to walk his dogs in the surrounding countryside. The West Country took Joe out of London in 1992 and created another world for him. This period of life, where he had his own place, coincided with Joe being happy in a supportive relationship. He appreciated places like Bridgwater and Taunton. Down to earth places full of ordinary people. Nearby, where he lived, was THE KINGSTON CLUB in Kingston St.Mary, which is a club for farmers. Stories of 'rodents attacking crops' and 'which Combine Harvesters are the most powerful' were discussed at the bar. On Sunday 17th November 2002, Joe took a short journey up the road to perform at The Palace Theatre, Bridgwater, a benefit for The Engine Room, Somerset's new media centre. 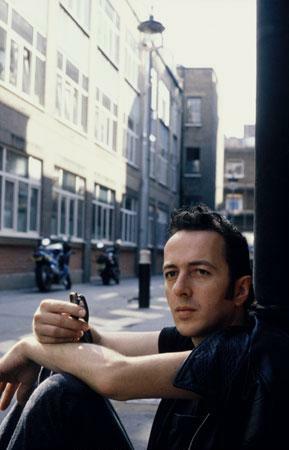 It is believed that Joe Strummer who 'simply faded away' had a congenital heart problem which he was unaware of and caused his heart simply to stop a little after 3pm on Sunday, 22nd December 2002 at his Somerset home after taking his dogs for a walk. He had sat down on his couch to read The Observer. His death certificate reveals he was suffering from an 'intra-mural coronary artery' - where one of the heart's main blood vessels grows inside the muscle wall. The condition is so rare there have only been 50 recorded cases during the last 40 years. Joe Strummer's long time friend and former band mate, Mick Jones suggested that, "This is something that he had all his life, that he never was aware of, and it could've happened any time from birth. It wasn't a heart attack as has been much reported, but actually a congenital heart defect that he was unaware of. And it could've happened any time, and that I think probably sheds a different light on... We felt more and more grateful for the time we had with him." The funeral cortege passed what used to be The Elgin pub in Ladbroke Grove, and other old Clash haunts where they had played some of their earliest gigs 25 years ago. Firefighters provided a guard of honour at the funeral of the punk rock singer. A Stetson sat on top of Strummer's coffin, which was adorned with stickers reading “Vinyl Rules” and “Question Authority”. A fire engine preceded the hearse into the grounds of Kensal Green Cemetery. Joe was cremated in a private ceremony on Monday, 30th December 2002 at the West London Crematorium, attended by Strummer's widow Lucinda, two daughters and step-daughter.
" On 21 August 2003, on what would have been Joe's fifty-first birthday, there was a celebratory concert in the hills above Granada. Mick Jones, Tymon Dogg, Jem Finer and Richard Dudanski were among those who played into the warm night. Afterwards, down in San Jose, Jazz and Lola took their portion of their father's ashes along the coast to a cliff of gnarled white rock, a beautiful, perfect spot. Behind it, in the desert, was the bikers' bar where Joe would enjoy Toxico, the marijuana-infusion tequila drink. As well as his two daughters, there was a small party present, including Jem and Marcia Finer, Lauren Jones and assorted children. Jazz still clutched the urn. 'Shall we keep it ?' she asked Lola. As Lola was replying in the affirmative, it flipped out of Jazz's hands, as though grabbed by a gust of wind, and hovered in the air above the cliff edge before smashing down onto a rock below. The urn's broken fragments were gathered and thrown out to sea.